*When I say “American” imagery, I’m referring to images beginning with the appearance of white Europeans on the continent. Native Americans have an incredibly rich and diverse history of image making, which I have not studied nearly enough to do justice to it. Images were rare in early colonial America. Many of the settlers were religious refugees from Europe, where the more ostentatious religions of Catholicism and Anglicanism were intolerant of their austere beliefs. The Calvinists and Puritans that made up early white America took the biblical saying “cursed is the man who carves an image or casts an idol” [Deuteronomy 27:15] very seriously. Puritans often complained about the Catholic devotion to paintings and sculptures in their churches, which they considered to be idolatry. Protestants focused on the word of God, and their plain, clean-lined churches reflect this. is typical of pre-eighteenth century images of preachers that would have appeared in books of sermons. Calvinists justified such images by regarding them as moral examples of faithfulness, meant to inspire such feelings in the readers. The importance of the word of God is emphasized by the presence of the Bible, which the Reverend Mather is engaged in reading (note the dainty glasses he holds in his right hand). One of the most important Protestant tenets was reading the Bible yourself to gain a personal understanding of God. John Foster was a member of Mather’s congregation, and would have been familiar with all these principles. It is evident from looking at the Reverend Mather that Foster was not a trained artist. The woodcut is simple and somewhat blocky, lacking the finesse typical in woodcuts done in Europe by trained artists at the same time. This was typical well into the colonial period. Trained artists were not in high demand in the new settlements, and those who did produce images were typically copying the work of European artists. However, although the print is lacking in depth and realism, Foster paid a lot of attention to the details in the face, especially the kind expression in the eyes. represents how far American imagery had come in just over half a century. 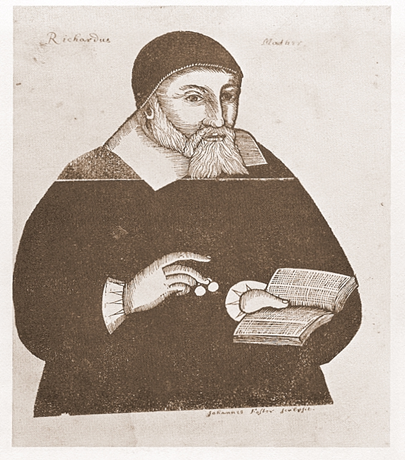 Cotton Mather was the son of Increase Mather, another preacher in the mold of his father, Richard Mather, and while their Calvinist religious beliefs were the same, their portraits are wildly dissimilar. Peter Pelham was a well-known mezzotint engraver based in Boston. Trained in England, he brought European expertise to America, and was, in fact, the stepfather of America’s first native painter, John Singleton Copley. 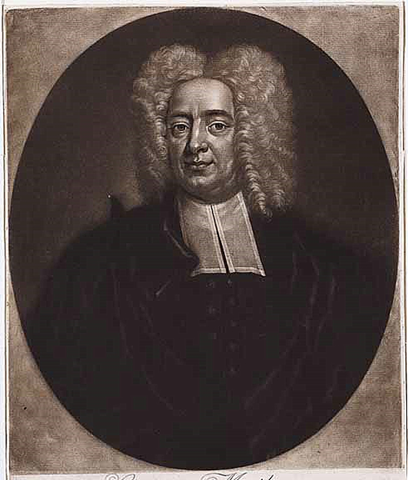 Mezzotint, which involved roughening the print plate with thousands of little dots made by a toothed metal tool, allows for a much greater variation of tone than woodcut, and Pelham’s expertise and training is clear in the great realism of the facial details and shading, and the delicate curls of Cotton Mather’s intriguing hair. Even the slight tonal changes in the background and Mather’s delicate beribboned bib speak to the advances made in American art in less than a century. Where Foster’s work was simplistic, austere, and geometric, Pelham’s piece is detailed, sophisticated, and evokes the best European work of the period. In spirit, both works represent the Puritanical religious spirit that still envelopes the American colonies. Colonists prided themselves on their religious purity and austere lives, even as they began to thrive and become wealthy. This new wealth is evident in Cotton Mather’s elaborate outfit and hair, set against the much more modest attire of his grandfather. In the fifty years between the two portraits, American colonists began to value images more highly, recognizing them as an ideal medium for spreading values and ideas to a wide group of people, regardless of their literacy level. This democratic property of images allowed art to become more and more important to colonists as they began their struggle for independence. Great article on American History. I’m European but I’ve always been fascinated about the first colonists that end up in America. Even now I think USA is way more religious with lots of fundamentalist Christians compared with Europe.